… is a very different place. 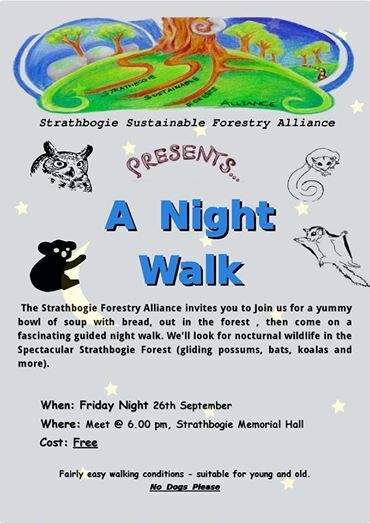 Join us for a night walk on Friday, to experience what happens in the Strathbogie Forest once darkness has fallen and the creatures of the night begin to stir. 6 pm meet at Strathbogie Hall & drive to the forest. 7 pm get the campfire going, then head out on a guided night-walk. 9 – 9.30 pm back at base camp for a cup of hot soup & a bread roll. BYO: sturdy walking boots, clothes for all seasons, torch or spotlight, binoculars, camera. If the weather looks inclement, an umbrella or raincoat will be handy. This activity is presented by the Strathbogie Sustainable Forestry Alliance and the Strathbogie Ranges Conservation Management Network. Last week, on Thursday September 11, the Victorian Minister for Agriculture Peter Walsh visited the Strathbogie Forest to see first hand the damage to our forests and to listen to our concerns. The Minister was accompanied by Member for Benalla, Bill Sykes and the National’s candidate for the new seat of Euroa, Stephanie Ryan. Representing the Strathbogie Sustainable Forestry Alliance, Sim and Bert met up with the visitors in Strathbogie Township, car-pooled and then drove out to the forest. As we’d had previous communications with the Minister, he was already partly informed of our views. Our group had written a letter to the Minister on August 15, outlining our objections to VicForests’ management of the Strathbogie State Forest (link). On August 26, along with representatives from the major environmental groups in the State, we attended a ’round-table’ discussion with the Minister and his Advisors, where we were again able to put our case and reinforce the arguments underpinning our campaign (link). We showed Minister Walsh the type of forest that VicForests insists is sawlog harvesting (pic link), as well as the ‘failed coupe’ (pic link), an example of what can happen when things go terribly wrong when logging mixed-species forest. The Minister, Bill and Steph listened to our concerns and participated in the discussion.